Soon after they married, Jon Woodruff asked his new wife Akiko Okusu if she’d like to take a trip to her native Japan. Not for a belated honeymoon, but to help him drag several hundred pounds of mud from the bottom of a remote, humid lagoon. Woodruff, a graduate student in the MIT/WHOI Joint Program, also needed a translator, not to mention someone to bail water from their raft. Would Okusu’s mother come along? This wasn’t the first time Woodruff corralled family members into assisting his research. 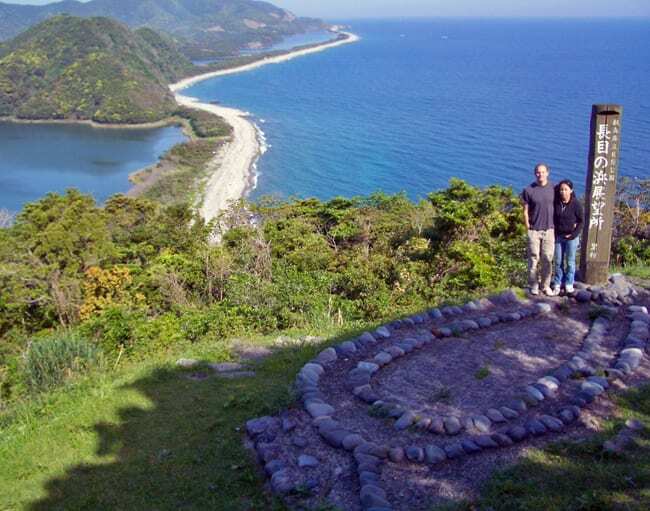 A year earlier, while he was in Japan introducing his parents to his future in-laws, he persuaded Okusu and his parents to join him for a side trip to Kami-koshiki, a small island about 12 miles off the southwest coast of the country’s mainland. Woodruff knew that lagoons located in this relatively placid coastal setting are periodically hit by hurricanes, or typhoons as they are called in this part of the world. Hurricanes generate heavy winds and large waves that stir up coarse grains of sand and bits of shell—material too heavy to be moved around by normal wind and waves. The material gets washed into the lagoon and settles to the bottom, leaving distinctive layers that are eventually buried by fine organic-rich mud that normally accumulates on the bottom of lagoons. Over decades and centuries, the sediment starts to resemble a many-layered cake. Woodruff’s plan was to plunge thin metal tubes into the muck on the lagoon bottom and extract cores of sediments. The deeper the core, the farther back in time Woodruff could see. Each 5-meter core can represent about 5,000 years, with telltale hurricane layers standing out like lines in a bar code. With enough good cores, Woodruff can pinpoint when hurricanes occurred in a particular place over hundreds of years. And with such a long record of hurricanes, scientists can begin to figure out exactly what factors and conditions lead to eras with more frequent and/or severe hurricanes. Understanding those key factors makes it easier to forecast what sort of hurricane activity we should prepare for in a future warming world. Woodruff’s wife, an assistant professor in biology at Simmons College, and mother-in-law proved game for the challenge. In summer 2006, they arrived in southern Japan along with 118 pounds of aluminum barrels, casings, two rubber rafts, and a box containing a seismic instrument nicknamed the “chirp” for the sound it makes. The chirp sent down high-frequency sound signals through the water to probe the bottom sediment and help Woodruff determine the best places to core. Every morning for the next week, the trio paddled out in a makeshift raft, staying cool in the oppressive tropical temperatures by dumping water on their heads and swimming in jellyfish-infested waters. For hours each day, Woodruff and Okusu extracted long pipes of heavy, wet muck. “There was a lot of caveman grunting and pulling with all of our might,” Woodruff said, which left the couple exhausted. At times they resorted to pounding the mud out using a sledge hammer. Meanwhile, Woodruff’s mother-in-law, Masako Okusu, helped with other essentials: translating, documenting data about Woodruff’s work, and bailing. By the end, Woodruff’s team had a dozen cores cut out, labeled, and packed for shipment to the United States, where Woodruff would analyze them. Centuries and millennia before hurricanes had names like Katrina and Mitch, they were pummeling coastlines. But only during the last 150 years or so have people kept track of hurricanes. More scattered reports and less reliable records “actually gets us back to the time of the Pilgrims,” said Jeff Donnelly, a geologist at Woods Hole Oceanographic Institution (WHOI) and Woodruff’s advisor, who taught him the fundamentals of coring for traces of ancient hurricanes. Beyond that, there’s not much for scientists to go on. That’s where cores come in. “Cores help us take a look at history over 5,000 years, and that’s a powerful tool,” Donnelly said. Working in a strategically located lagoon off Puerto Rico, Donnelly and Woodruff compiled the longest record of strong hurricanes in the Atlantic region. The 5,000-year record identified two factors that appeared to heighten Atlantic hurricane activity: weak El Niños in the tropical Pacific and strong monsoons in West Africa. Scientists have established that strong El Niños can stunt hurricane activity by causing strong high-altitude winds that inhibit hurricane formation. Other researchers have identified that storms over western Africa generate atmospheric waves that move into the Atlantic and provide “seedlings” for hurricane development. Donnelly and Woodruff’s research, reported 2007 in the journal Nature, spotlights these two phenomena as key factors that should be incorporated into models that predict how climate changes will affect hurricane activity. In 1999, Woodruff followed in the footsteps of his grandfather and father and earned a graduate degree from MIT.For several years he searched for the best way to apply his skills, teaching high school science and math, working as an engineering consultant, and then entering the MIT/WHOI Joint Program, where he eventually hooked up with Donnelly, who appreciated Woodruff’s engineering background. Those enterprising skills come in handy in hurricane research, which sometimes requires working in remote locations, Donnelly said. Woodruff has made boat anchors out of weights used for pickling vegetables and boats out of children’s toy rafts and a beer cooler, and he earned a reputation for roping family into his projects. 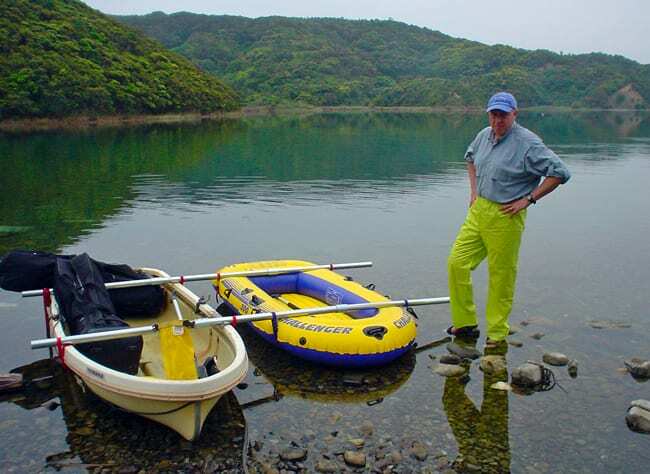 On his initial reconnaissance mission to Japan, Woodruff and his dad built a boat out of two plastic rubber rafts purchased at Wal-Mart and mounted it with coring gear. They tethered this to a wooden boat borrowed from a local fisherman, which Woodruff used as a platform for gathering cores of bottom sediment. His father christened the floating contraption The Unsinkable. “Too bad it wasn’t,” Woodruff said, looking at photos from that trip. 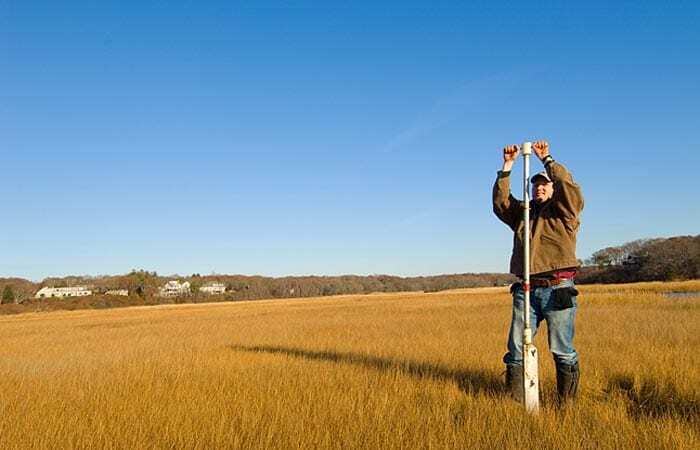 Still, cores from that expedition provided Woodruff what he deemed “the perfect dirt layer cake.” They contained enough viable information to justify a $4,500 grant from the WHOI Coastal Ocean Institute for further research: his trip with his wife and mother-in-law. Now an assistant professor at the University of Massachusetts at Amherst, he plans to continue research in the western North Pacific and six other hurricane-prone regions, filling in pieces in the global hurricane jigsaw puzzle across space and through time. 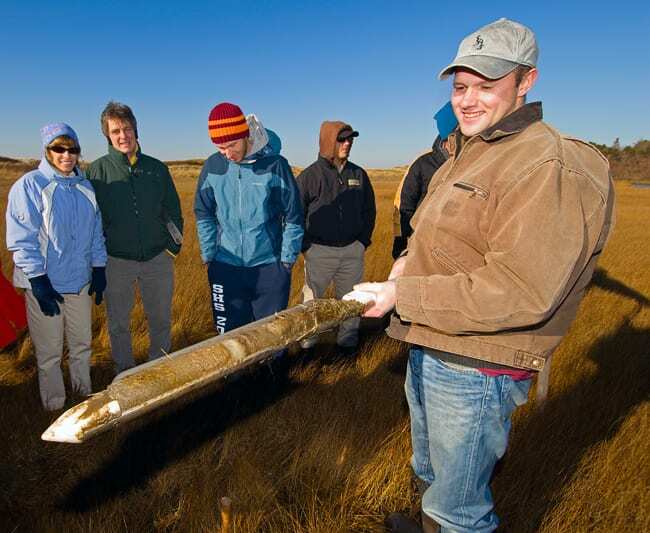 Funding for this research was provided by the Earth Systems History Program of the National Science Foundation, the National Geographic Society, the Coastal Ocean Institute at WHOI, and the Andrew W. Mellon Foundation Endowed Fund for Innovative Research. 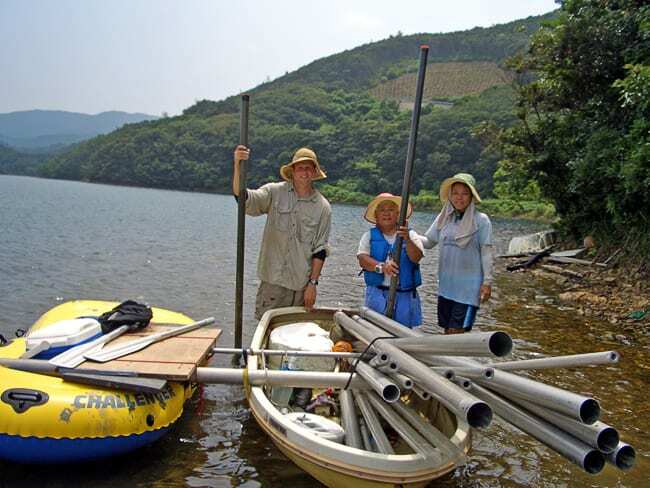 Woodruff's initial research in Japan proved viable, and he returned with a grant from WHOI's Coastal Ocean Institute to collect more sediment cores. On his team were his wife Akiko Okusu (right) and mother-in-law Masako Okusu (who translated and kept the boat bailed).